March 19, 2011 - The International Civil Aviation Organization (ICAO) accepted a large scale model of the all-new CSeries commercial jetliner as a special gift from Bombardier Aerospace. The model, which is destined to be placed on permanent display in the lobby of ICAO's headquarters in Montréal, was presented by Bombardier officials at a special ceremony before an international audience of industry policy-makers, regulators and associations. "The environmental benefits of the CSeries aircraft in combating climate change, reducing noise for communities in the vicinity of airports and improving local air quality are in line with the three main goals of our environmental strategy," said Raymond Benjamin, Secretary General, ICAO. "ICAO is already taking the environmental characteristics of this aircraft into consideration for future standards for fuel burn and noise." "The timing of this presentation is particularly significant for Bombardier, as this year marks our 25th anniversary in the aerospace industry," said Guy C. Hachey, President and Chief Operating Officer, Bombardier Aerospace. 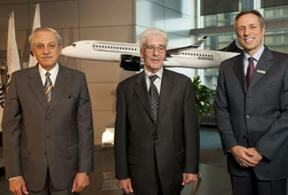 From left to right: Roberto Kobeh González, President of the Council, ICAO; Raymond Benjamin, Secretary General, ICAO; and Guy C. Hachey, President and Chief Operating Officer, Bombardier Aerospace, with the large scale model of the all-new CSeries commercial jetliner that is destined to be placed on permanent display in the lobby of ICAO's headquarters in Montréal. "Since our entry into civil aviation, the men and women of Bombardier Aerospace have worked with dedication and passion to design and deliver innovative aircraft that continue to change the face of business and commercial aviation. The development of the new CSeries aircraft continues Bombardier's tradition of providing innovative aviation solutions that meet both current and future needs," added Mr. Hachey. "We are extremely proud that a model of our game-changing CSeries airliner, which has been designed to meet the challenge of balancing profitability with reduced environmental impact, will now be permanently displayed here at ICAO." The CSeries aircraft will contribute greatly to airlines' sustainability and future growth by emitting 20* per cent less CO2 and 50* per cent less NOx. It will also fly four* times quieter, and deliver dramatic energy savings – 20* per cent fuel burn advantage, as well as 15* per cent improved cash operating costs versus current in-production aircraft of similar size. A world-leading manufacturer of innovative transportation solutions, from commercial aircraft and business jets to rail transportation equipment, systems and services, Bombardier is a global corporation headquartered in Canada. Its revenues for the fiscal year ended Jan. 31, 2010, were $19.4 billion.